Russian Summer | Let us be sweethearts. a young woman from a noble family who became a devoted anarchist and decided to do more than talk. In 1878, Vera walked into the receiving room of the Governor of St. Petersburg, swathed in an oversized shawl. Under the shawl, she hid a gun. As she approached General Fedor Trepov, she withdrew the gun and, with a cry of “revenge!”, shot him. The revenge she sought was for a friend of hers, Alexei Bogolyubov, a young man who had been flogged for refusing to remove his hat in the presence of General Trepov. Unrest was rife in the ranks of the bourgeois at this time. Vera was involved for several years and came to recognize that many of the people in the movement were content to simply talk of a utopian future. With her single act, Vera set in motion the “Age of Assassination” that unsettled Russian society. Her trial for murder (even though Trepov did not die), was attended by the creme de la creme of society dressed in all their finery. Vera, a generally quiet and reserved person, was the picture of composure. Her attorney did a brilliant job of turning the trial into a condemnation of General Trepov and the Russian government in general. Acquitted, Vera left the country and discovered Marxism. She became a passionate supporter of socialism and was aghast at the use of assassination as a political tool of her fellow revolutionaries. She translated the works of Marx into Russian and both her trial and her translations (and further writing) influenced the leaders in the early 20th century who eventually brought about the rise of the Soviet Union. Siljak does a masterful job presenting the story of Zasulich. The people who populate the book, the members of Vera’s social circle, her friends, her influences, her lovers, are presented in a vibrant manner that allows the reader to feel the energy and flow of life that guided Vera. Vera herself is rendered as a fully three-dimensional person. The reader gains deep insight into her psyche, her thought process, and her feelings. She is a woman to be admired, a woman of action, a woman of thoughts, a woman who functioned in a manner outside the confines of her time. Yet, even Vera regretted some of the effects of her actions and words. This complicated woman makes for a great subject and Siljak has created a lively book that captures her brilliantly. One of Vera’s biggest regrets was that the “Age of Assassination”set in motion by her own attempted assassination eventually led to the murder of Tsar Alexander II on March 1, 1881. 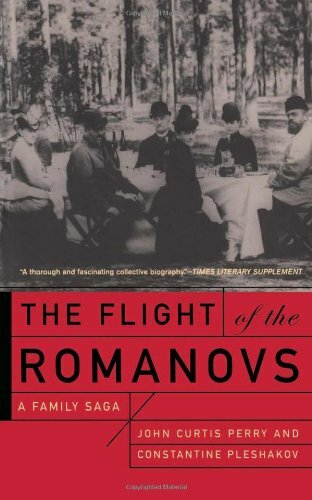 John Curtis Perry and Constantine Pleshakov document the aftermath of this assassination in The Flight of the Romanovs: A Family Saga. The story of the family of Tsar Nicolas II and his family, murdered in 1918 is fairly well known. The women with bodices lined with jewels, dying slowly as their bodices prevented assassins bullets from hitting the mark. The story that is not well known is what happened to the rest of the Romanovs. This book presents the tales of many of the vast number of Romanovs. The Uncles, Aunts, Cousins, Nieces and Nephews that supported the monarchy, or the revolution, or their self-interest, or their adopted homes, or the homeland of their non-Romanov parents. Those who buried their heads in the sand, and the ones whose lives seemed touched with tragedy long before the revolution. Perry and Pleshakov weave the stories of these various family members in a smooth manner that makes for an eminently readable book. Even with the various Nicholas’, Alexander’s, Constantine’s, Alexandra’s, Olga’s, Perry and Pleshakov use family nicknames to help the reader keep all of the stories straight. It’s fascinating to follow this large family at this time in history that saw so many changes, and particularly fascinating how many strong-willed women influenced the course of history. In the Romanov family, the old rejoinder of a strong woman being behind every strong man is particularly true. The Romanovs of the earlier 20th century paid the price for generations of decisions made by their antecedents, as well as their own choices. The ones who left Russia generally survived. Those who thought they could protect themselves in Russia, generally could not. Tragedy and Triumph, all in my Russian Summer. *This is the title of the book as I read it. It has also been released under the alternate title shown in the image of the book cover.